Knee Pain Caused by Tight Shoulders? After my article on Iliotibial Band Syndrome I received a lot of questions asking how and what other areas of the body can cause ITB pain. While it is nearly impossible to describe in detail the separate scenarios on here, I decided I would give a quick insight describing how biomechanical flaws in other areas, such as the shoulder, can cause pain clear down in the knee. If you haven’t read the ITB article I suggest you read that before continuing. Beneath the superficial layers of our skin there’s a connective tissue called fascia that is made primarily of collagen. 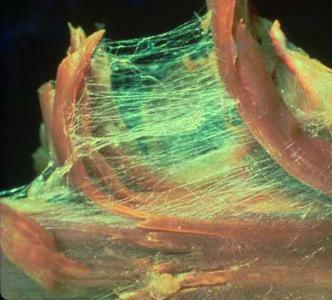 When layers of tissue are separated this fascia looks similar to a spider web or cotton. 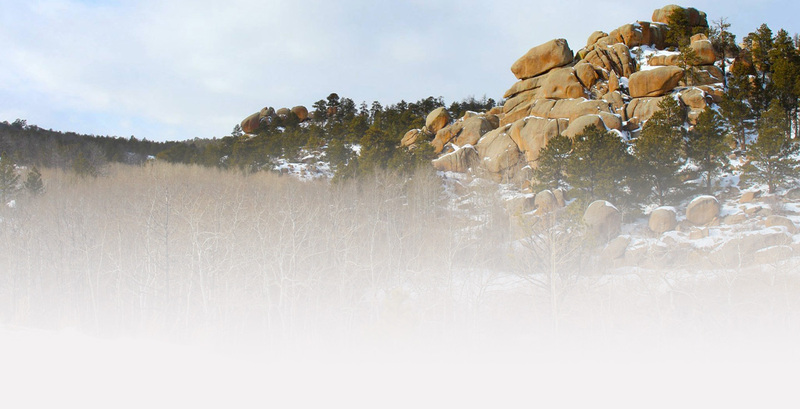 This fascia connects the superficial skin, muscles, ligaments, tendons, and bones together in to one connected system, kind of like roots in aspen trees. With all this fascia seemingly connected together it becomes a relatively strong structure that is very good at resisting tension. 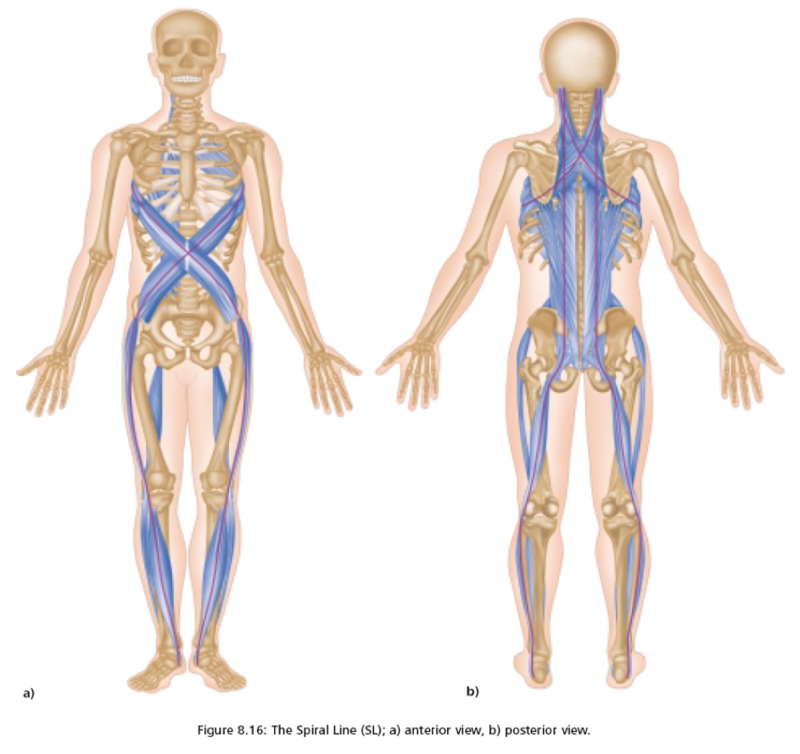 Since this is one connected structure, putting tension on an area of this fascia has a domino-like effect in putting tension on fascia in different areas of the body. Think of it like wearing a spandex suit and pulling on an area of it. You would see tension dispersed throughout the suit in different areas of the body. This picture shows fascia connection “lines” or “trains”. When someone get’s abnormal or restricted movement in an area of one of these lines the fascia can be disrupted anywhere along that line, as well as other areas. So for example, if someone is simply tight in their right teres major/minor and lat area(right armpit), you can follow that line and see how it would create tension on the lateral side of the left hip, thigh, and knee. This can explain why ITB syndrome in some people may actually be caused by a completely different area of the body and why focusing on the area of pain or trying to correct hip biomechanics doesn’t seem to help. I used this example because this is a common problem I see in people who lift weights and focus on lat pulldowns, pullups, bent over rows, etc. but ignore the muscle balancing and stretching that needs to be done. These fascia lines are just one example of how a painful area may be caused by a completely different area of the body. In order to fully diagnose an area of pain a thorough examination would need to be done focusing on full body biomechanics and specific orthopedic tests. Too often we focus just on the area of pain and need to look at the bigger picture.